Home alarm systems are a valuable tool for keeping your home and possessions safe. Home alarm systems can run from inexpensive door alarm models to high-end systems that can respond to numerous break-in scenarios. You might be in the position of having to reset your home alarm system if you've recently experienced a brownout, blackout or other electricity failure. Another common situation is purchasing a new home with a pre-existing alarm system that needs to be reset. 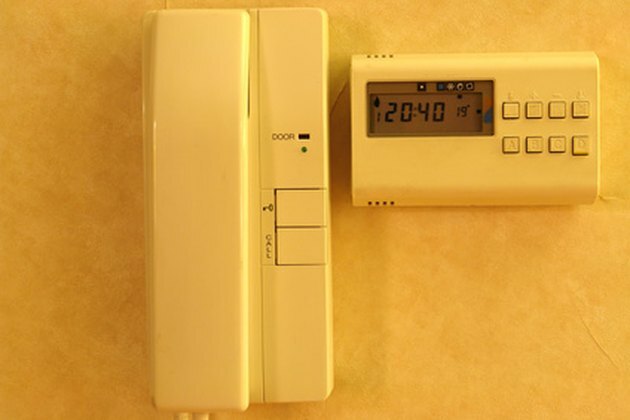 A home security and heating system are shown on a wall. Examine your home alarm system closely. 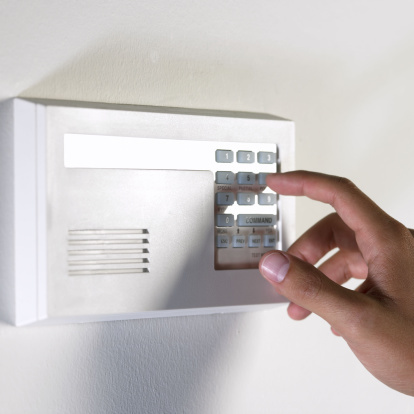 Many alarm systems have a labeled "reset" button that you can press and hold down to reset the system. There also might be a power button you can use to turn the alarm system off, then on again after a few minutes. Refer to your copy of the user guide that came with the alarm. Look up "System Reset," "Resetting Your Alarm." or "Reset" in the index. Follow the instructions described in the guide. If you no longer have the user's guide for your alarm, you might be able to look up the reset procedure on the company website. Note the make and model of your home alarm system, as well as the manufacturer. Write down all the details you find for future reference. Go to the manufacturer's website and find your model of home alarm. Many alarm company websites will let you search by model number. Look up any user's guides that might be available, find the section on resetting your alarm, and follow the given instructions. If you don't have access to any user guide for your home alarm, you might need to contact the manufacturer for information about resetting your home alarm. Look up the email or phone number of the manufacturer of your home alarm system, and contact a representative for further information.